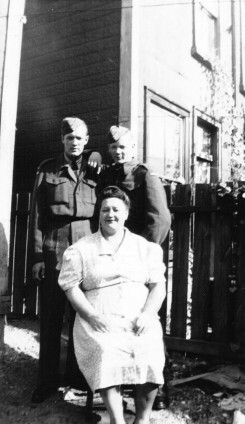 Frank and Chuck with their mother Lillian Enright. ‘Frank’ George Francis Enright served with the Military Police in Halifax.He grew up in Toronto, later lived in Waterloo, Ontario and had a cottage at Lakeside, Ontario. He married May Mank and they raised two children: Phillip and Pamela. His brother also served in WW11.